A round up on what’s happening at the TV News Archive by Katie Dahl and Nancy Watzman. Additional research by Robin Chin. When President Donald Trump takes the podium to deliver his first official State of the Union address to a joint session of Congress on Tuesday, January 30, he’ll be following in the footsteps of the nation’s very first president, George Washington, long before there was cable TV or radio. In Washington’s time, the speech was not yet known as the State of the Union, but the annual message, and according to Donald Ritchie, former U.S. Senate historian, seen here in a clip from C-Span, the practice was “to [physically] cut the State of the Union message up into paragraphs and create committees to address each one of the issues the president suggested.” There were no standing committees in Congress at that time. Now it’s fact-checkers who examine the speech, line by line, and since 2017, we’ve been annotating our TV news programs with fact-checks of Trump, top administration officials, and the four top congressional leaders, Democrat and Republican. Make history by being a beta tester of FactStream, a new free app for iPhone or iPad, which will deliver live fact-checks of Trump’s State of the Union address from national fact-checking organizations. The app is a product of Duke Reporters Lab Tech & Check collective, of which the Internet Archive’s TV News Archive is a member. We’ll be adding the fact-checks to the TV News Archive, too. At the TV News Archive, we’ve got historical footage of some past State of the Union addresses, listed below. 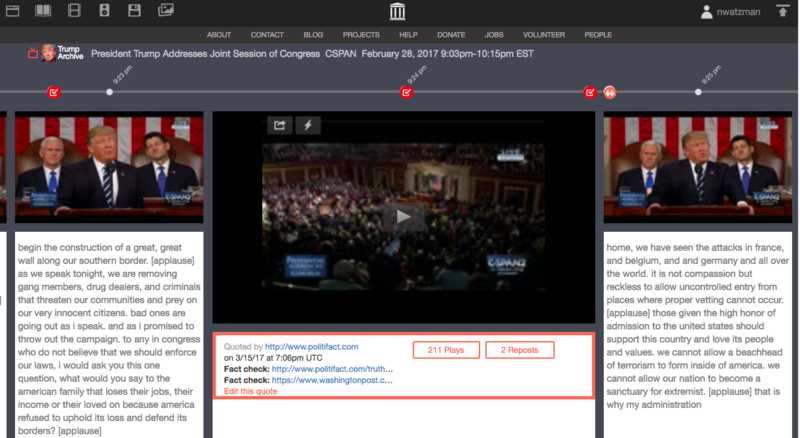 Last year we annotated Trump’s address to Congress – not officially a State of the Union, since he was newly inaugurated – with fact-checks from our fact-checking partners, FactCheck.org, PolitiFact, and The Washington Post’s Fact Checker. Fact-checks are noted with a red check mark on the TV News Archive filmstrip screen. This entry was posted in Announcements, News, Television Archive and tagged Barack Obama, Donald Trump, Duke Reporters' Lab, fact checks, Factcheck.org, FactStream, Gerald Ford, Lyndon Johnson, PolitiFact, State of the Union, The Washington Post's Fact Checker. Bookmark the permalink. As an exiled Pom and a paper Kiwi, I have long been a supporter and user of Archive.org material, and my now 16 y/o Thai-born daughter has also. It has literally helped to boost her education, and we will always be grateful for that. However, we have both become utterly sick of the seemingly blatant and incessant religio-political ideological bias of Archive.org since the democratic election of the 45th US President, Donald Trump. Enuff already. For Pete’s sake, #Give.It.A.Rest. and stick to your knitting. We get it that you don’t approve of the democratic election of this President, but quite frankly, we don’t want it rammed down our throats at every opportunity and we don’t give a damn about your insular bigotry. We are all for democracy in little old New Zealand and the rest of the world, and we view the US as the leading light of Freedom, Liberty and Democracy. The Loser mentality and propaganda exhibited by the anti-Trump brigade would surely not impress anyone who can think for themselves and wishes to live in a free democracy. We suggest you all get over it and move on, and make sure to vote in the next Presidential election. Like it or not, you get the President you voted for, and the one you deserve. Wow, it’s excellence. Thanks for sharing with us. Would you consider partnering with Amara (amara.org) to caption your videos, for deaf/hard of hearing viewers, fact-checking, and text search? Their platform is free, and there is even a volunteer function, where users can submit captions and translations for videos. Platforms like TED, GitHub, and Scientific American use it. I have no association with Amara, and was not asked to post this here. At least caption those State of the Union Addresses which are still uncaptioned on your site.